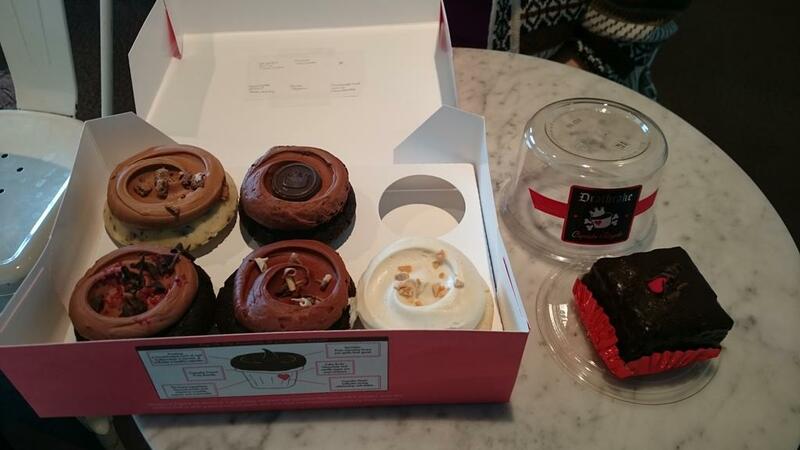 You may recall from last week that our first cupcake outing was…somewhat daunting. 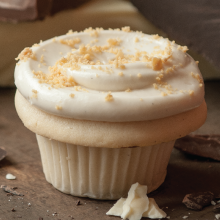 So you can imagine our relief when our trip to Trophy Cupcakes involved only one cupcake of the month. Of course, given the paranoia induced by our previous Really Smart Outing, we bought a lovely and light lemon cupcake to share afterwards. Just in case our tastebuds needed rescue. 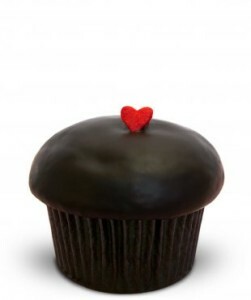 Our Valrhona Cupcake is filled with Raspberry Buttercream then dipped in bittersweet Belgian chocolate ganache and topped with a pretty red heart. 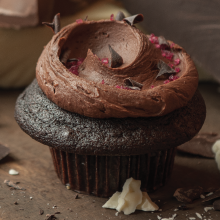 Nothing says “I Love You” like Dark Belgian Chocolate and Raspberries! Amber: What I’m about to say is meant in the best possible way. 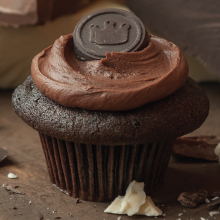 Understand that Trophy Cupcakes is, to my mouth, as good a cupcake as Cupcake Royale, but they’re different. They’re smaller and denser, which is sometimes exactly what I want. Their frosting tends to be a lighter texture (not applicable to ganache, like we got this month). 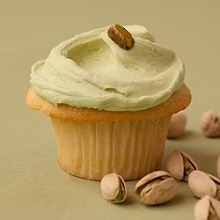 But they have the same high quality of ingredients and tendency towards excellent taste that Cupcake Royale has. Keep that in mind for the next sentence. 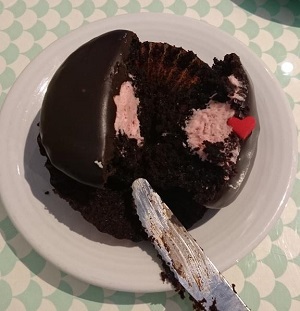 This cupcake tastes like an expensive and high quality version of a Hostess cupcake, but the cream filling is raspberry flavoured. Which means that I ate with eager and childish delight. The only thing I’d change is that I’d want more cream filling. I always want more cream filling. 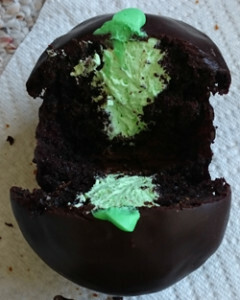 (See picture proof that my desire for more cream filling might not be reasonable.) 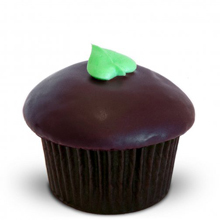 This straightforward beauty has made my mouth fall in love with cupcakes again, something I was worried about after the assault by cupcake earlier this month. Yes, the ganache was dark, but it was thin and perfectly complemented by the raspberry cream filling. That filling. That’s the way to put fruit flavor in a dessert. A way that’s light, whipped, and creamy. Not gelatinous goop, but airy creaminess that makes your tongue float. 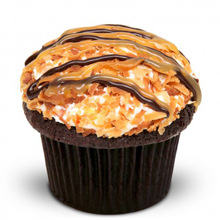 This was the cupcake that made everything else OK. It healed my wounds. I want to eat sheets of the ganache and bathe in the filling. Thanks for the new fantasy, cupcake. One of the things we like best about this world is its food. 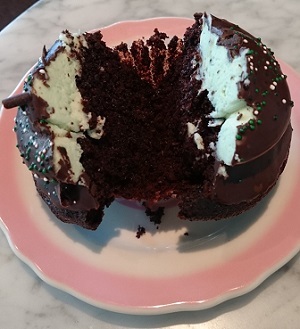 I mean, we like other things, but we knew immediately that we were going to need to make our “goal” to try the monthly cupcake flavours at two local shops that are sort of The Big Deal in cupcakes part of what we talked about in this blog. We don’t want to come off as completely hating this world. So, every month, we’re going to have (at the very least) posts for the monthly cupcake flavours at Cupcake Royale and Trophy Cupcakes. Available Jan 29th – Feb 28th. Cat: This had me from the beginning. Say caramel, and I’m there. Add salt to that descriptor? Why isn’t this already in my mouth. But it’s the top that makes this cake. Lightest. Frosting. Ever. 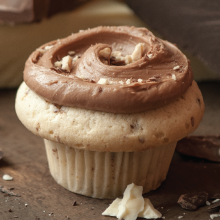 The cake itself is solid, your basic delicious morsel, but it’s the whipped frosting and gentle softball-stage caramel in the middle that makes this an amazing cupcake. 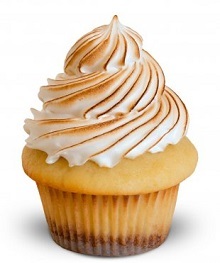 Amber: As with any Cupcake Royale cupcake, the texture is moist and awesome. 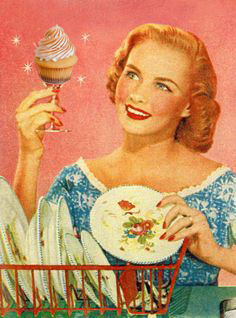 And this is a tasty cupcake, but the only malt appears to be in the frosting. And I would probably like this more if I had extra frosting. Cat: Nothing gave this away as malt before I tried it. There was no smell, no obvious crumbs or chunks in the cake, and that was the first warning sign. All the malt flavor was manifest in the crumbled malt bits on top and some slight flavor gently folded into the frosting. The rest of the flavor was from the milk chocolate chunks. Good quality chocolate, but I expect to drown in the taste of Whoppers when I eat something malted, not to be grasping for flavor. Amber: With these five flavours, I know they’re going for something fancy for Valentine’s Day. And this one is definitely that. For some reason, I didn’t enjoy that sense of fanciness here. I liked their strawberry filling, but didn’t feel there was enough strawberry taste to the whole cupcake. It was good but not one I’m probably buying again. Cat: Ugh. Now this is a mouth sensation I cannot abide. Jam in cake is an abomination to my palate. It’s all goop, slimy texture combined with whipped buttercream. The strawberry flavor is strong–I would say too strong. It’s the kind of sticky sweetness that permeates the Valentine’s holiday. It’s the saccharine cake equivalent of an insipid box of chocolates with grocery store roses. It fits the festive bill, but feels uninspired. It’s the first cupcake I don’t…no, I can’t…finish. Available Jan 29 – Feb 28th. Amber: I’m immediately intrigued. Cat told me to smell it before she cut it, and I can definitely smell the smoked flavour! (Break in writing to actually eat.) I have no idea whether or not I like this. My mouth and nose are now flooded with something that makes me think of piles of sauce-slathered meats. It’s so outside my taste experiences that I just…don’t know. 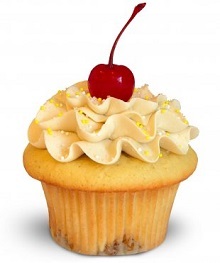 (Plus, I’ve already eaten 1.5 cupcakes, so my body is probably in overload.) Maybe a babycake eaten on its own would work? I’m just…unsure…Everything is smoke. Cat: Wow. 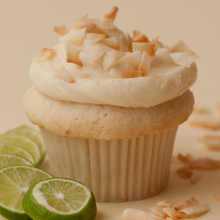 Is that eau de hickory chip in the frosting? 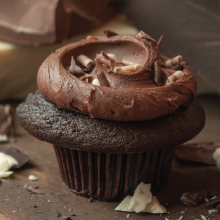 Eating this cupcake is like eating ham-cured chocolate. 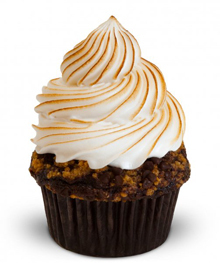 The cupcake works on the weirdness factor for a while–capitalizing on the novelty of things like bacon maple bars, but fancy-pants-ifying the entire process–but it gets too cloying as I eat more. All I taste is smoke. All I smell is smoke. All I am is smoke. Amber: I have no palate left. 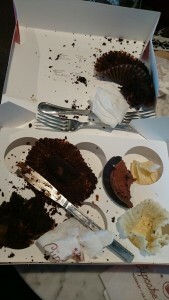 It has been destroyed by the last two cupcakes. And possibly by the incredibly questionable decision to eat 2.5 cupcakes on a mostly-empty stomach, early on a Monday morning. Yes, my tongue tells me this is a chocolate cupcake with chocolate frosting…my tongue also tells me it likes this filling, but can’t for the life of me figure out what it’s supposed to be. (Cat looks it up. Cheesecake? Really? At this point, my tongue and I have no choice but to trust the internet.) 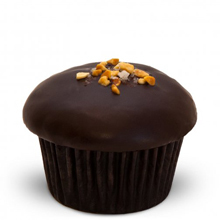 So, I like it best of the three fully chocolate cupcakes I’ve just eaten, especially the filling, but I still think the tendency of fancy cupcake shops to lean rich in their chocolates is going to trip me up every time. Cat: So it’s cheesecake batter. Huh. The combined flavors taste like a high-end chocolate box, all semi-sweet and rich tasting. I think it’s what death tastes like. Every possible flavor on the chocolate spectrum rolled into one. I’m chocolate exhausted. What is the meaning of life? What is the meaning of this taste experiment? How many cake fragments can I leave in the box? I give up. One more bite of cake today will be my death. Available Jan 29th – Feb 15th. Amber: Cat was right to save hers for later. I powered through, because my stubborn determination and the sugar high completely overwhelmed my common sense. One bite though. Just one bite. I wasn’t sure if I was having a hard time swallowing due to laughter (thanks for not snapping a photo, Cat) or my body protesting more sweetness. Moist. Rich. Death. I am pretty sure, if soil were edible, this is what the earth I’m buried in will taste like. I mean that in the best possible way. Cat: It took 24 hours before I could bring myself to tackle the Deathcake. It might have been a little too soon. I could only take three bites, put it away, wait an hour, take three more, and so on. The slow and steady sugar overdose instead of the massive munching the day before. But on to the Deathcake itself. Yes, it’s rich, but not too bad. I don’t dig the middle espresso layer, personal preference, but the rest? Oh, the rest. 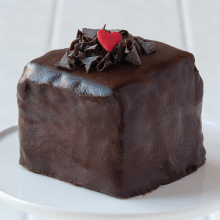 The ganache is swimming through a chocolate ocean. The cake is every bit as moist and flavorful as any cake should be. 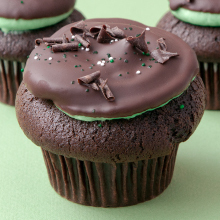 Unlike the black bottom, where the chocolates battle, these work together for decadent delight. Slow, measured, take-your-time delight. Here is the resulting carnage…We raced out, so high on sugar and in need of salt licks, that we probably looked like unattended toddlers on Halloween. Eeeeeeee! Overall, we agreed the Caramelized White Chocolate was the best, though we admit that, if we were true scientists, we’d go back to see how much they benefited from being first eaten (though we did try to go from lightest to darkest on the theory that would be best for our palates and fairest for the cupcakes). Fortunately, we are just mature enough to know better than to do this again. Y’know, until there’s another month with five flavours…. UPDATE: It was 5.25 days before Amber was able to eat anything sweet. (She actually salted her whole-grain cereal the morning after this excursion and got slightly ill when she accidentally ingested a little jam 3 days after the cupcakes.) NEVER AGAIN.